they are sunshine, food and medicine for the soul. Luther Burbank"
Those flowers certainly make me feel better, so much so that I have chosen to bake an apple frangipane tart...something that requires a little extra effort to put together. I don't even mind the trouble. Besides flowers, an apple a day is something I need to keep myself healthy. This is the first time I am baking something with apples. Yes, the very first time since five years into my baking journey. Pardon my ignorant, I didn't know that the skin would turn a ugly dull brown after spending 45mins in the oven. Next time I should just peel the apples. Most apple tart recipes would recommend a good coating of apricot jam over the apple slices when the tart is out from the oven. I never like glossy looking pies or tarts, so I skip the step and dust it with some icing sugar instead. A rather cheery and sunshine looking apple tart, don't you think so? I wish I could share it with my friends...hey, someone should start a food dispatch service here! I am submitting this apple frangipane tart to Aspiring Bakers #10: Easy as Pie (August 2011) hosted by Janine of Not the Kitchen Sink! Thanks Janine for hosting this round and Small Small Baker for championing this monthly baking event! Lightly grease an 18cm tart pan (with removable base) with butter, set aside. With a manual whisk, cream butter and sugar till light and fluffy. Dribble in the egg, whisk and mix well. Add in the almond powder and fold with a spatula. Sieve over the flour and fold in with the spatula. Gather the mixture to form a dough. Brush the top of the rim with some egg wash (optional). Bake in pre-heated oven at 180 degC for 10~12 mins or until the pastry is lightly golden browned. Let cool and set aside. Add in grounded almond powder. Fold with a spatula till well incorporated. Sieve over the flour onto the mixture. Mix with the spatula. Add in vanilla extract and mix well. Spread 1/3 of the filling onto the cooled pastry crust. Line with some apple slices. Spread the remaining filling evenly, ensure the edges are filled up. Arrange apple slices on top. (Make sure the apple slices are well drained.) Brush the melted butter over the apple slices. Bake in pre-heated oven at 170 degC for 40 ~ 45mins, until the edges and filling turn golden brown. Leave to cool for a few minutes. Unmould and let cool completely, and dust with some icing sugar. Best serve on the day it is baked. Very colorful flowers - certainly brightens any recipient's day. 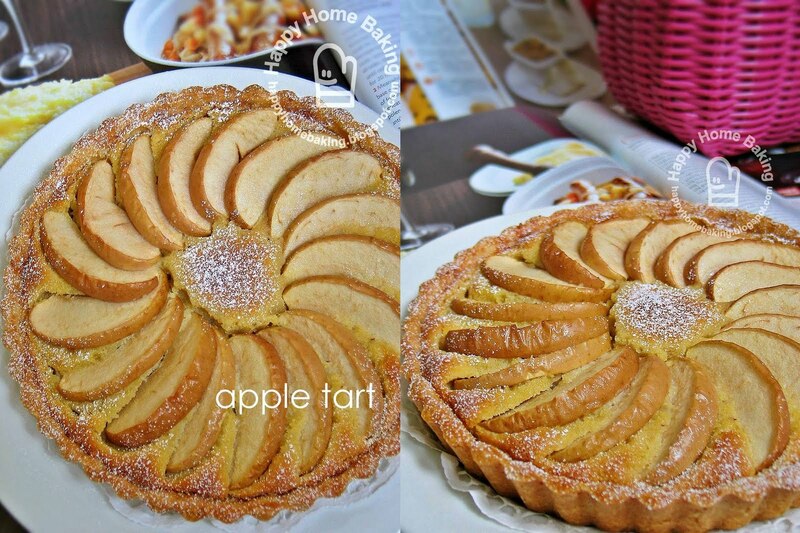 The Apple Frangipane Tart looks delicious. This is so sweet! I love the bright colours of the basket and the flowers. Yum... apple tart... my favorite. Lovely basket of flowers. The Apple Frangipane Tart looks very yummy too. Both the flowers and tart look great. Hi Angel, you are right, I have totally forgotten I have made apple muffins before. It was so long ago that it didn't register in my memory, lol! I am your \fans so I can remember. Kekeke. Here I am craving for a pie and I see your post! oh my... lovely lovely apple frangipane tart you have! so beautiful flowers you have gotten. always nice to have friends that think of you isn't it? I've just being looking through your blog and you've made some amazing stuff! I am a sucker for a good cake and there's several on here that had me drooling! I hope to reach a standard such as yours one day! Thanks for this recipe! I used it for creating a salak (snake fruit) tart. I was having trouble finding any baking recipes for salak, so I tried looking for apple ones. The almond complimented the fruit perfectly! I used almond extract instead of vanilla and also topped the tart with almonds. Family and friends loved it!